A few weeks ago we took part in the Wedding Industry Awards. These awards are really valuable to us as it is our customers that vote for us. Eek! We were we pleased and honoured to be Regional Winners and National Finalists in the Best Wedding Dressmaker Designer Category. 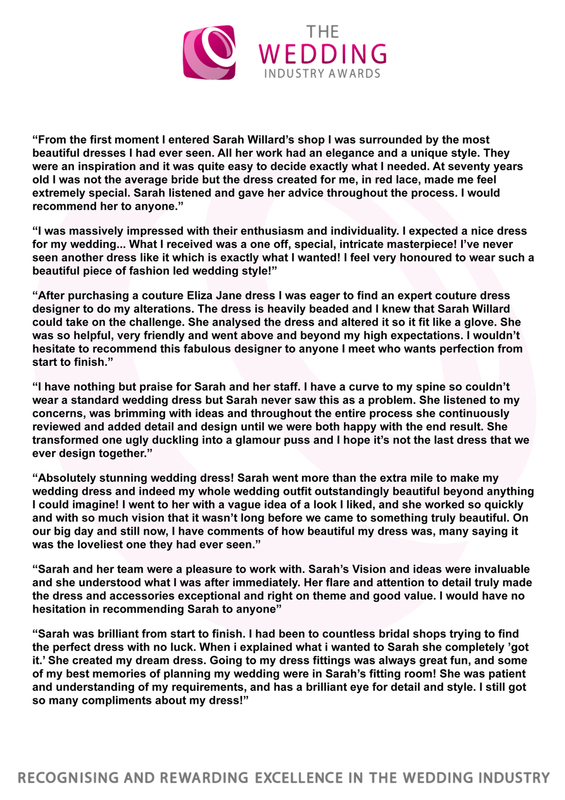 We will always be really grateful to our customers who supported us by voting for Sarah Willard Couture. Thank you so much for taking the time to spread the word about us, the artisan designer dressmakers from Staffordshire. At the end of the competition we get to see what you all said about us (anonymously of course!) Well, we were really chuffed to see what you had to say! We love our jobs and create dresses with passion. We sew because it's a true vocation, and it is utterly fabulous to receive such amazing feedback!